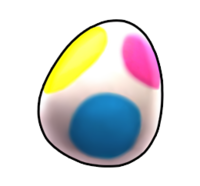 The Mystery Egg is one of Yoshi's special items in Mario Kart Arcade GP, Mario Kart Arcade GP 2, and Mario Kart Arcade GP DX. When used, the Mystery Egg drops behind the player's kart, much like a Banana. When a racer runs into the dropped Mystery Egg, they become affected by a random status condition. The Mystery Egg bears a strong resemblance to Mini-Yoshi's egg from Paper Mario: The Thousand-Year Door. This page was last edited on March 1, 2019, at 01:10.